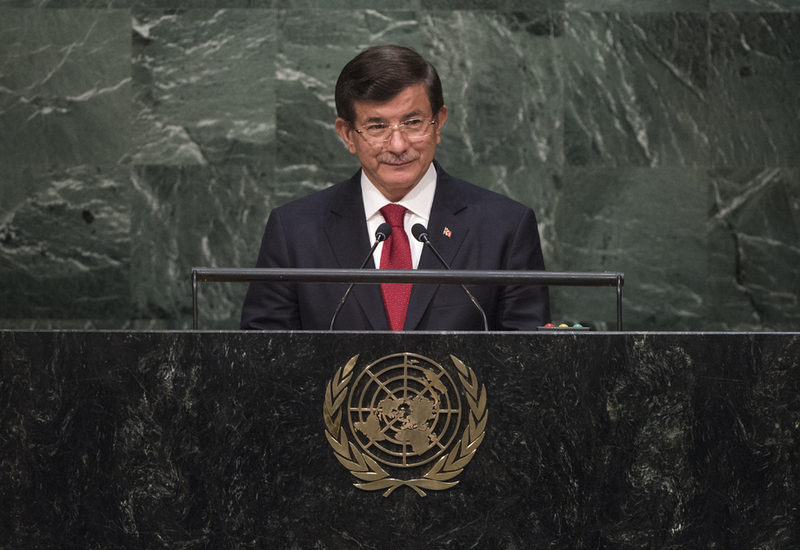 AHMET DAVUTOGLU, Prime Minister of Turkey, recalling the story of three-year old Aylan Kurdi whose body washed ashore earlier this month in the Aegean Sea in an attempt to escape the barrel bombs in his native Syria, urged the world community to unite its efforts “no later than today” to effectively deal with the complexities and tragedies facing humanity. Assuming more than its fair share of the burden, his country had provided protection to more than two million Syrians and 200,000 Iraqis, and now sheltered the largest number of refugees in the world. Embracing those fleeing war and persecution, it had invested to date almost $8 billion, while international contributions remained at a “mere” $417 million. To date in Turkey, he said 66,000 Syrian babies had been born, and 9 million medical consultations and 280,000 surgical operations performed. Also, 230,000 school-aged Syrian children received formal education, while another 460,000 would be integrated in the education system by year’s end. Further recounting significant numbers of Syrians who had drowned, fled the country or had been displaced, he cautioned that the tragedy would not end before the Syrian people had a legitimate government that truly represented their will and enjoyed their full consent. Until then the world community must act swiftly to provide them safety in their homeland. As a promised voice for the Syrians, he proposed the inclusion of the item “Global awareness of the tragedies of irregular migrants…with a specific emphasis on Syrian asylum-seekers” in the agenda of the Assembly’s current session, which had been accepted this month. Also suffering were Palestinians, he said, for whom peace must be achieved based on an independent, sovereign and contiguous Palestinian State. Underscoring the importance of their right to live together as one, he said his country would continue to provide Palestinians the political and economic support to enable them to lead a dignified life. Also of utmost concern was the issue of foreign terrorist fighters, which required enhanced international cooperation, especially in the area of information exchange, he said. Such cooperation was also needed to address other global challenges relating to security, poverty and inequality. Those were priorities for his country evidenced by the leadership roles it had undertaken in certain initiatives. He expressed hope for a political solution to the situation in Ukraine and the recognition of the territorial integrity of Azerbaijan and Georgia, adding that cooperation with Africa was also an important pillar in his country’s foreign policy. He said his country remained committed to a just, comprehensive and lasting solution in Cyprus based on the political equality of two peoples and equal ownership of the island. The representative of Turkey rejected allegations made against her country and said her country continued to stand by the people of Syria.